2538-RBTP-DST is rated 4.9 out of 5 by 15. Delta's exclusive DIAMOND Seal® Technology uses a valve with a tough diamond coating. InnoFlex® PEX waterways keep water inside the faucet out of contact with potential metal contaminants. This powerful combination brings you a faucet built to last up to five million uses. Delta is committed to supporting water conservation around the globe and has been recognized as WaterSense® Manufacturer Partner of the Year in 2011, 2013, and 2014. Rated 5 out of 5 by Installer from Customers love this model I have designed many bathrooms with the Lahara set. It goes well with many styles. 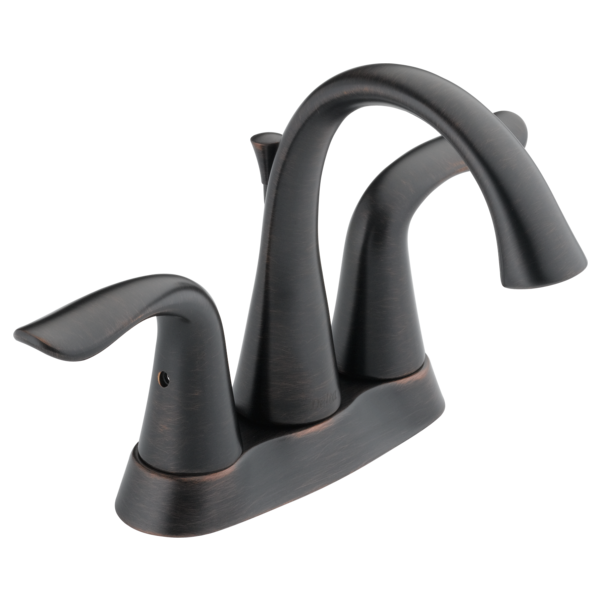 Rated 5 out of 5 by Sheri from Lahara Centerset Batheoom Faucet The faucet is eye appealing and the finish does not show water spots easily. The popup drain assembly works great. We have purchased several things from Build.com and all have been reliable products. Rated 5 out of 5 by Txag98 from Great Upgrade The product works great. Water flow better than expected. Better than the brand we replaced. Looks classy as well. Rated 5 out of 5 by Mikey from Love the Lahara Bought the Delta Lahara faucet for my bathroom renovation . The faucet has a very elegant look and feels very well made. Love it!! Rated 5 out of 5 by matt0945 from Delta 2538 Received the faucet in a timely manner and in good shape. I haven't installed it yet but it looks good and seems to be a good quality faucet. Rated 5 out of 5 by Chris from Attractive, easy install I bought 2 of these to update my guest bath. They were easy to install and the look was a much needed improvement. Rated 5 out of 5 by Believe from Great Style!! This faucet is a lot of bang for the buck. It's really graceful and easy to use. The only slight issue with this faucet is when cleaning, it's not quite as spread out as the widespread so cleaning can be a little more challenging. It's a Great Look for a Great Price!! Rated 5 out of 5 by sheri from Love the Lahara Love the look and the functionality of our new faucets. I bought a model home that had Delta faucet installed. It looks exactly like the Lahara model, but when I bought the aerator/wrench and valve assembly, it didn't fit. I believe the aerator I need is the 1.2, vs the 1.5 that it states on the specs. As for the valve, it didn't have the black casing around the bottom and the metal stick in the middle seems to be longer than the one I RP60400. Is there a different or older model of the Lahara that uses smaller aerator and valve? If so, what kind of valve would I need? can you tell me what the TP stands for and what the difference is between this faucet and the 2538-mpu-dst? I could't find the initials TP on the model number chart. where did you see TP? Some places like to make up their own numbers for faucets so that other companies, contractors can not go and compare prices.